Our company is engaged in offering a wide gamut of Vacuum Packed Pillow to our esteemed clients. These pillows are fabricated using premium quality of fabric under the supervision of our highly skilled professionals. 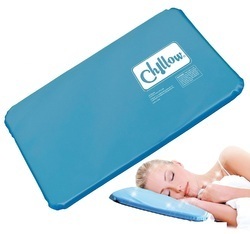 Pillows are designed scientifically to provide right cushioning for head and neck. It is essential to hold the neck and spine in neutral position. Soft fabric shells are filled with fibre fill (Recon) for hygiene and softness. Available in standard sizes and shapes. - Hollow Siliconized & conjugated fibre for optimum comfort feet. Size: 17" x 27" or 16" x 24"
Features: 100% Cotton. Suitable for homes,hotels and hospitals. Usage/Application: Suitable for homes,hotels and hospitals. Sleep Products Mfg. Co. Pvt. Ltd.